CAPE CANAVERAL, Florida - A dog was killed and one person was transported to the hospital following a residential structure fire that erupted around 9 a.m. in the 100 block of Buchanan Avenue in Cape Canaveral, Florida. 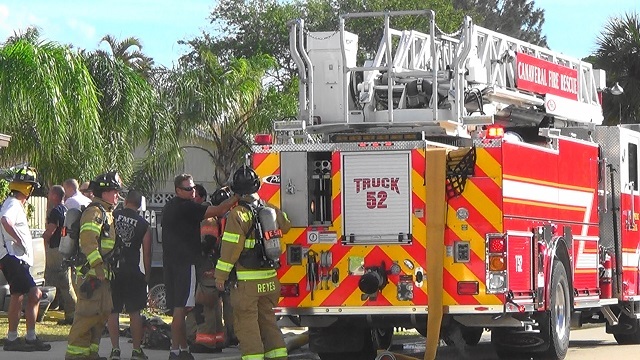 Fire crews from Port Canaveral, Cape Canaveral Volunteer Fire, Cocoa Beach, and Brevard County Fire Rescue were called in to extinguish the blaze. Fire crews were able to contain the blaze to only one side of the one-story duplex. BCFR transported a woman to the hospital, the extent of her injuries are unknown at this time. The State Fire Marshall has been called in to investigate the cause of the fire.